Visual determinations of bilirubin levels are largely inaccurate, even among experienced providers. If the infant appears icteric before the week-2 visit, the first step is to test for fractionated bilirubin level. If the 2-week-old infant is breast-fed and without dark urine or acholic stool (implying breast-milk jaundice), the provider may reevaluate the infant 1 week later. If jaundice persists, laboratory evaluation is recommended. Details about the onset of jaundice, presence of dark urine or acholic stool, feeding history (eg, intake of soy formula), and timing of the first bowel movement (as delayed passage of meconium can signal cystic fibrosis) may be helpful. Family history may be significant for consanguinity or history of siblings with neonatal cholestasis (suggesting a genetic cause), history of prior fetal losses (suggesting GALD), or maternal infection during pregnancy (indicating TORCH [Toxoplasmosis, Other (syphilis, varicella-zoster, parvovirus B19), Rubella, Cytomegalovirus, and Herpes] infection). Suggested laboratory evaluation is outlined in Table 2. Infants with BA are generally healthy at birth and develop progressive jaundice within 2 months. They present with signs of cholestasis including acholic stools, dark urine, hepatomegaly, and, in some cases, congenital anomalies. Evaluation should be completed as quickly as possible. Laboratory examination reveals hyperbilirubinemia, mild-to-moderate transaminitis, and a disproportionately elevated gamma-glutamyl transferase (GGT). Abdominal ultrasound may show an abnormal gallbladder and/or common bile duct. Additional findings, such as polysplenia/asplenia or heterotaxy, may increase the suspicion for BA. A hepatobiliary iminodiacetic acid (HIDA) scan may show absent tracer excretion into the bile and intestine. Pretreatment with phenobarbital for 3 to 5 days enhances tracer excretion; however, this may delay diagnosis, and given the low specificity (70%) of HIDA scans,1 it does not obviate the need for liver biopsy. Liver biopsy in BA may show bile duct proliferation, fibrosis, and inflammation. These findings may be nonspecific and result in a false-negative diagnosis if done too early. Diagnosis is made by identifying extrahepatic siderosis by oral mucosa biopsy. T2-weighted magnetic resonance imaging (MRI) shows abnormalities in iron-laden tissues, specifically the pancreas, thyroid, and myocardium. Many liver diseases cause hepatic siderosis; therefore, this finding cannot be used for differentiation. Interestingly, the spleen, bone marrow, and lymph nodes appear normal, as GALD spares the reticuloendothelial system from siderosis. When suspicion for GALD is high and both mucosal biopsy and MRI are negative, a liver biopsy for C5b-9 complex staining may be performed. Altered metabolism of galactose caused by deficiency in any one of three specific enzymes results in galactosemia (Figure 1). Every state in the United States includes galactosemia on the newborn screen; however, infants may become symptomatic prior to receiving the results. Initial laboratory evaluation may show hyperbilirubinemia, transaminitis, and coagulopathy. Renal tubular acidosis, increased plasma amino acids, and increased plasma/urine galactitol levels may be seen. A positive test for urine-reducing substances (indicating galactosuria) is neither sensitive nor specific for galactosemia, and the reducing substance must be differentiated from glucosuria. If there is suspicion for galactosemia or if the newborn screen is positive, the infant should immediately be switched to a soy formula. False-negative screens may occur in infants who fed poorly or were fed lactose-free formula before the sample was drawn. The definitive diagnosis for galactosemia is made by quantitative erythrocyte GALT activity. Measuring quantitative GALT activity identifies variants with partial enzyme activity. Unfortunately, red blood cell transfusion can affect this value for as long as 3 months.15 If GALT activity is normal, consider GALK or GALE deficiency. Disorders involved in the transport of bile acids are considered secondary BASDs. These include progressive familial intrahepatic cholestasis, Smith-Lemli-Optiz syndrome, and Zellweger spectrum disorders. Signs of fat-soluble vitamin malabsorption and cholestasis will be present. Infants will have direct hyperbilirubinemia, transaminitis, and normal GGT. Diagnosis is made by analysis of urinary bile acids with mass spectrometry. Tyrosinemia is caused by defective tyrosine metabolism (Figure 2). 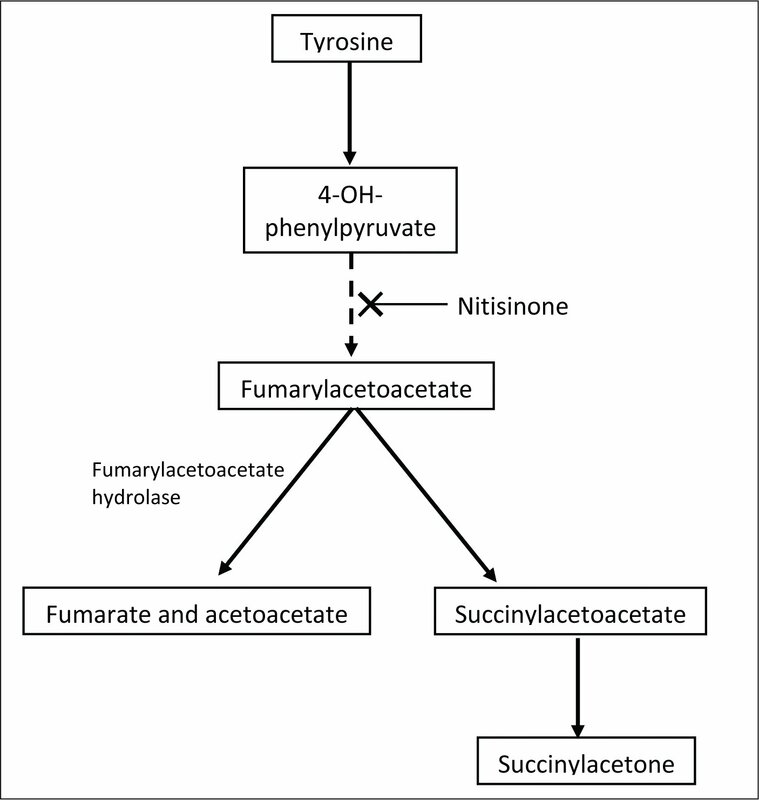 Deficiency of fumarylacetoacetate hydrolase leads to build up of tyrosine, as well as toxic metabolites such as succinylacetone, which cause damage to the liver, kidney, and peripheral nerves. Renal tubular acidosis and coagulopathy disproportionate to the degree of liver disease are common. Mild cholestasis and increased alpha-fetoprotein, plasma tyrosine, and plasma/urine succinylacetone may be present. Urine organic acids may be positive, reflecting tyrosine metabolites. Diagnosis is by confirmation of characteristic biochemical findings or genetic testing. Alpha-1-antitrypsin (A1AT) is the most common genetic cause of liver disease in the neonate. A1AT is a protease inhibitor produced in the liver that inhibits neutrophil elastase from breaking down elastin in the pulmonary alveoli. In alpha-1-antitrypsin deficiency (A1ATD), a genetic defect modifies A1AT so that it is produced but cannot be secreted, and it then accumulates in the liver. Infants presenting with A1ATD have signs of liver dysfunction, including hepatomegaly, transaminitis, ascites, and coagulopathy. Phenotyping by isoelectric focusing is the gold standard; when this is not available, genotyping provides definitive diagnosis. One phenotype, PiZZ, is responsible for nearly all A1ATD patients with both emphysema and liver disease. Associated abnormalities in Alagille syndrome include cardiac anomalies (most commonly peripheral pulmonary stenosis), butterfly vertebrae, eye findings (most commonly posterior embryotoxon), and dysmorphic facies. Short stature, developmental delay, and systemic and intracranial vascular malformations may be present. Laboratory studies show hyperbilirubinemia, variably elevated transaminases, and disproportionally increased GGT. Diagnosis remains challenging as there are many causes of bile duct paucity; therefore, liver biopsy is not a requirement for diagnosis. In those with characteristic clinical features, genetic testing is recommended. Infants on TPN for prolonged periods are at risk for developing cholestasis. Risk of IFALD is compounded by prematurity, immaturity of the newborn liver, damage from infections (specifically necrotizing enterocolitis and central line infections), and disruption of enterohepatic circulation due to continuous TPN and/or lack of enteral feeds. Infants with advanced IFLAD may show signs of portal hypertension, thrombocytopenia, and esophageal varices. Severity of liver failure can be evaluated by fractionated bilirubin, prothrombin time/partial thromboplastin time, and albumin. 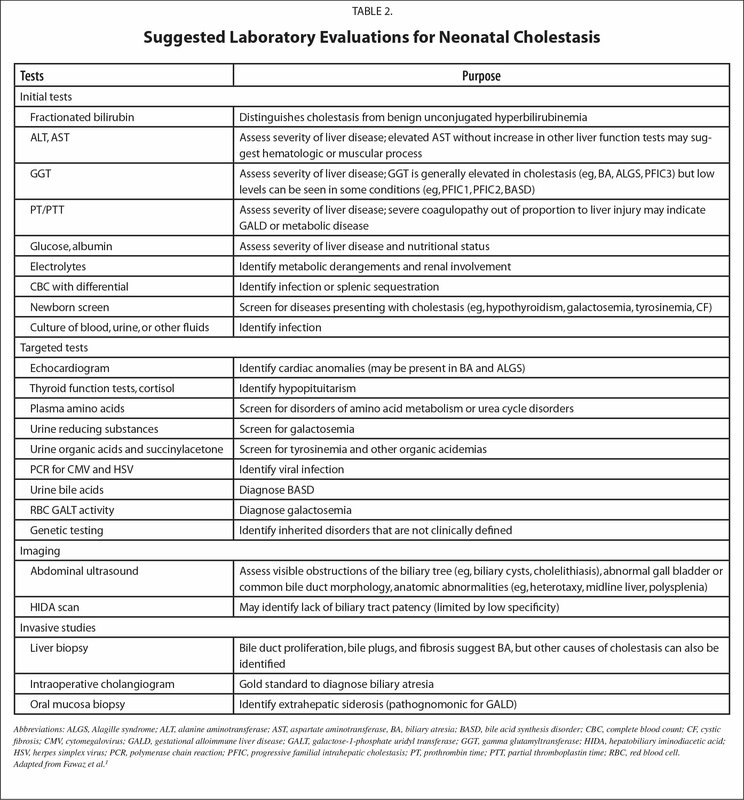 Although signs and symptoms should guide laboratory investigations, many providers have a low threshold to consider infectious causes for neonatal cholestasis. Work-up may include serologic, hematologic, and urine studies, as well as radiographic imaging. This article serves as a basic introduction to neonatal cholestasis for trainees, but it is not comprehensive. Neonatal cholestasis can be due to a variety of diseases resulting in impairment in formation or excretion of bile, and there are many rare conditions not described here. A simple fractionated bilirubin test can differentiate cholestasis from the more common unconjugated hyperbilirubinemia. In addition, patient history, physical examination, and specific laboratory investigations can assist with diagnosis and prompt treatment of what may be a rare and fatal disease. Gotze T, Blessing H, Grillhösl C, Gerner P, Hoerning A. Neonatal cholestasis – differential diagnoses, current diagnostic procedures, and treatment. Front Pediatr. 2015;3:43. doi:10.3389/fped.2015.00043 [CrossRef]. Whitington PF. Gestational alloimmune liver disease and neonatal hemochromatosis. Semin Liver Dis. 2012;32(4):325–332. doi:10.1055/s-0032-1329901 [CrossRef]. Fridovich-Keil JL, Gambello MJ, Singh RH, Sharer JD. Duarte variant galactosemia. In: Pagon RA, Adam MP, Ardinger HH, , eds. GeneReviews [Internet]. http://www.ncbi.nlm.nih.gov/books/NBK258640. Accessed October 17, 2018. Berry GT. Classic galactosemia and clinical variant galactosemia. In: Adam MP, Ardinger HH, Pagon RA, , eds. GeneReviews [Internet]. https://www.ncbi.nlm.nih.gov/books/NBK1518. Accessed October 17, 2018. Rooney JC, Hill DJ, Danks DM. Jaundice associated with bacterial infection in the newborn. Am J Dis Child. 1971;122(1):39–41. Ranjani Ananth, MD, is a Fellow in Neonatology, Comer Children's Hospital, Pritzker School of Medicine, The University of Chicago. Address correspondence to Ranjani Ananth, MD, Comer Children's Hospital, Pritzker School of Medicine, The University of Chicago, 5721 S. Maryland Avenue, Chicago, IL 60637; email: Ranjani.ananth@uchospitals.edu.